Every single one of us wants, needs, and yearns to belong. Or … is it just me? No. Wanting to belong must be a primal kind of thing, whether we admit it or not. The newly arrived immigrant, like so many young adults, just has a harder time hiding it. Immigrants tend to wear that need on their sleeves, but the rest of us are too busy and distracted by our own yearnings to notice. I believe that this compulsion to “belong” is directly linked to our survival. Our need for community, our search for ourselves, our tribe, our people, is a never-ending quest. Most of us are still looking. Who hasn’t felt alien, isolated, or awkward, often all at the same time? Now stir in the added burden of knowing what was left behind—the aunties, the grandmas, the colours, the aromas … the familiar. No matter how the exit took place, under dire threat or with a sense of adventure, the immigrant always wres-tles with memories of some irreplaceable treasures, forever lost. When you think about it, how could an immigrant story not be compelling? My own story is, and was, compelling, and I don’t even remember it. My father came to Canada as a baby and late in his life went back to Croatia on an extended holiday, where he met and fell in love with my mother. He married her. And then he spent the next two years tirelessly working to bring my mother from Yugoslavia to Canada. Since my mother’s family was still being punished by the Communist government of the day, his efforts were useless. Finally, under some pressure from the Canadian government, Yugoslavia issued her a twenty-four-hour exit visa on the day that I was born in Zagreb. I arrived in Canada on October 26, 1955, on the Queen Elizabeth II. I was thirteen days old. Six months later my father died. It was a cruel joke. My mother, bewildered and adrift in a strange land, couldn’t cope. The language was impenetrable, there was no family, and there had been no time to make friends. The colours here were too bright and harsh, and the sounds of Canadian life, with all its clamouring machinery and cars, too noisy. And she was alone—well, except for me. When I was about eightseven months old, Mama took me to the lake. Literally. She couldn’t stand another perplexing, fearful day, wondering how she was going to support us in this cold land. She picked me up, held me tight, and started walking into the still-frigid Lake Erie water. Mama couldn’t swim. Icy ripples of water bit into her legs with every step, causing her to stumble and lurch, but she was persistent. My mother was determined to kill us both. When the water reached her waist, she stopped. I slept like a baby throughout this entire ordeal, happy to accommodate whatever she had in mind. Mama says to this day that it was a “hand of God” kind of thing. She felt pressure on her shoulder, then both her shoulders. Then a whispering. The wind? The wind urged her not to commit this mortal sin, not to risk damning her soul and the soul of her baby for all eternity. “But how …” The wind told her that it would be okay. That life in Canada would be good. Mama walked back to shore with a resolve that hasn’t faltered in over fifty years. Never mind that because my father was a Canadian citizen, I was immediately deemed a “Canadian Born Abroad.” Never mind my dramatic exit and then entry into this country when I was less than two weeks old. I believe that Mama and I were both baptized Canadian on that unseasonably cold day in early June April, in Lake Erie, Ontario. As “Canadian” as I am, I’ve made a career it seems from milking the more outrageous aspects of my Eastern European immigrant roots. Much of my fiction revolves around the themes of “otherness” and yes, of wanting to “belong.” Yet, even as I write about it, I forget what impact those themes may have on my audience. I think I forget I have an audience. When I toured with my two most recent books, Me and the Blondes and Better Than Blonde, I was met with a phenomenon that both startled me and inspired this anthology. Time and again, during author signings, one or both of my books would be thrust at me with shaking gloved hands. This would occur more frequently if there was a very long line, which I hasten to add, only happens if you have a nuclear-charged teacher/librarian. “Mrs. Toten,” a voice would falter, then regain some urgency. “Mrs. Toten, I don’t … I can’t … I have to tell you how much your book means to me.” Since the book was still shaking and the voice still faltering, I would look up and invariably connect with a young woman in full burqa, covered from head to toe, with only a mesh window for her eyes. I confess to being stunned each time it happened. I guess I “got” why the Blonde books were embraced by blondes, by anyone of Eastern European extraction, and even more generally by anyone from Europe, period. But teens lining up in their burqas and shalwar-kamiz? I finally screwed up the courage to ask a girl in a burqa why. Why did she like the book so much? “Because I am Sophie.” Enough said, apparently. Sophie Kandinsky is my excitable Bulgarian-Polish heroine. When we meet her Sophie is an outsider because of her culture and family, she is “other” in a brand-new school. And the penny dropped. My “new” Canadian readers were seeing themselves in Sophie’s shoes no matter where they came from, no matter what their cultural heritage was. “Other” is other. Then I started paying attention, real attention, to my audiences in school auditoriums across this country. In most cases almost half the kids in my groups were not born in Canada, and that number rose dramatically when I asked how many of them had parents who were not born in Canada. This was as true for the kids in a Calgary suburb as for high school students in the interior of British Columbia. It was certainly so in all of Toronto and its environs, but also for most parts heading on our way east. Where are their stories? I wondered. Every immigrant has a story, and these fourteen stories, each brilliantly told, underline and bring home that truth. I credit or blame my immigrant roots and our constant moving for turning me into a writer. Immigrants are, so often, hyper-aware, hyper-alert to their surroundings. We are alive to every potential snub or slur. We can track a raised eyebrow that is invisible to everyone else at the table. We are forever searching for the unwritten social rules, the clues to belonging. Every immigrant story is a highly idiosyncratic rollercoaster of emotions, humiliations, and triumphs, yet most of these pieces at least touch on language as a common flashpoint. It appears that language can be an impenetrable barrier, even when your mother tongue is English! Richardo Keens-Douglas grew up speaking English in Grenada. Yet, at nineteen, he had to drum out the troublesome milky rhythms of his island accent in order to “succeed” as a Canadian actor. Rachel Manley also transported herself and her hypnotic Jamaican lilt to an entirely unappreciative audience in Montreal, where she was stalled and perplexed by the language. Linda Granfield’s Boston brogue was so thick, she needed the aid of a helpful “interpreter” at the University of Toronto, and her accent trips her up to this day. Alice Kuipers’s English accent never held her back, but some of the actual words morphed and became incomprehensible on their way from her native Manchester to Saskatoon. Still out West, we meet a bewildered nine-year-old Eva Wiseman, fresh from Hungary and plopped uncomprehendingly onto a Winnipeg playground, where she faces a baseball aimed at her head. Our two writers from India were English speaking, yet only Rachna Gilmore writes about accents both coming and going. Her clipped private-school accent of Mumbai makes way for the plummier tones of London, England, and is modified again to better suit the flatter sounds of Prince Edward Island. Mahtab Narsimhan isn’t hampered by accents or English per se, but instead almost drowns in the “alphabet soup” of her first Canadian job in information technology. Even though our youngest contributor, Boonaa Mohammed, was born in Canada of Ethiopian heritage, his English is shaped by his parents’ culture and arguably by the culture of his chosen artistic profession, the muscular world of spoken-word poetry. Marina Nemat learned English in her native Iran in a gentler time and then enticed her young son to the language with nursery rhymes in a gentler country. Meanwhile, Dimitri Nasrallah segmented his life into Arab, Greek, and English while in the “waiting room” countries of his family’s exile, only to find all these languages useless in Montreal. Finally, Rui Umezawa and Richard Poplak were both English speakers in their teens, but both communicated more vividly, if silently, through the language of American pop culture. Richard was plunked into a multicultural arts school in Toronto directly from apartheid-era South Africa, and Rui came of age in the seventies in Milwaukee, Wisconsin, an experience that was anything but Happy Days. Some of our writers came here for love, some for adventure. Others came to escape horror or deprivation, and still others were the unwitting hostages of determined parents. All had a longing to belong, and all have been enriched by and continue to enrich this country immeasurably. Open this book to any story. Dip in and out at your leisure. I hope you’ll find yourself in between the lines and perhaps feel a little less alone. These are fourteen extraordinary journeys. No need to pack your bags—just turn the page. 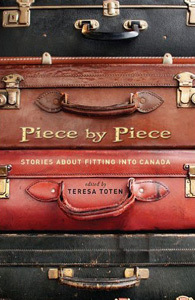 Excerpted from Piece By Piece edited by Teresa Toten. Copyright © 2010 by Teresa Toten. Excerpted by permission of Penguin Books. No part of this excerpt may be reproduced or reprinted without permission in writing from the publisher. 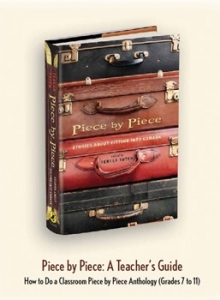 download a discussion guide to accompany Piece By Piece, designed for grades 7 – 11.